This module discusses the Principles of Forest Stewardship. These principles were designed to help members of the Nova Scotia Forest Products Association become better stewards of the forest. There are 7 principles in all covering many aspects of forest operations. Conforming to the principles will allow contractors, woodlot owners and industry to contribute to the sustainable use of Nova Scotia Forests. Forests are important to Nova Scotia. Seventy-five percent of Nova Scotia is forested. This represents about four million hectares (10 million acres). Forests provide a multitude of benefits to Nova Scotians, including cultural, economic and social benefits. For example, the lumber and pulp and paper industry generates over 1 billion dollars in revenue each year. Of course lumber and pulp and paper are not the only products produced from Nova Scotia forests. Significant revenue is generated from Christmas tree, maple syrup and fuelwood production. Nova Scotians are also now exploring less traditional products from forests such as mushrooms, ginseng and other medicinal plants. Eco-tourism is also becoming important. Fishing and hunting generates 3 million dollars in revenue each year in Nova Scotia. These are, of course, the economic benefits which are no more important than the other benefits. We enjoy clean fresh water in Nova Scotia. There are many opportunities for people to use our forests for picnicking, hiking, and other recreational uses. There are many users of the forest and many benefits can be gained. But we must balance all uses and we must try to maintain all benefits. In order to do that we must manage sustainably. As members of the Nova Scotia Forest Products Association, we are committed too the sustainable development of Nova Scotia forests. We can show the commitment to sustainability by adopting the Principles of Forest Stewardship and becoming better stewards of the forest. As stewards of the forest we have the responsibility to manage sustainably for all Nova Scotians. The Board of Directors of the Nova Scotia Forest Products Association has adopted the Principles of Forest Stewardship. These principles were designed to help members of the association become better stewards of the forest. There are 7 principles in all covering many aspects of forest operations. Conforming to the principles will allow contractors, woodlot owners and industry to contribute to the sustainable use of Nova Scotia Forests. Forest planning and operations will be conducted in accordance with the Forest/Wildlife Standards for Nova Scotia which are designed to sustain forest biodiversity and wildlife habitat. Harvesting operations will be designed to facilitate forest renewal either by natural regeneration or planting. Forest roads and water crossings will be constructed in accordance with the Standards of the Nova Scotia Department of the Environment. The health and safety of employees and the public will not be compromised by any forest practice. Through the Forest Products Association of Nova Scotia, public awareness and information on the Nova Scotia forest industry and Nova Scotia forests will be promoted. Members will cooperate with the Association in responding to public concerns about forest practices in a sensitive and progressive manner. Private landowners have the right to manage their individual forest properties in accordance with their own objectives, while meeting or exceeding government standards for environmental protection and forest conservation. Use of forests is being increasingly regulated by government legislation. More and more consumers are requiring wood products from forests certified as sustainable. These trends are reflective of the public concerns about the environment. That is why it is important for the association to show leadership in the industry to demonstrate that forests are managed sustainably and that the industry is a responsible manager. The following home study manual will provide a guide to implementing the principles on your own forest operation. Through the use of exercises you will create an operations management plan on a typical woodlot. A greater understanding of how these principles can work on your own operation will be gained. The key to a well-run organization is a plan. Having a plan allows you to foresee and avoid problems, it can save you money, assures quality work and shows due diligence. Usually you will have a plan about what you are going to do before you do it. If you are going to harvest timber from a woodlot you will know where you are going to cut the trees, what kind of trees you will cut and how you will get them to roadside. An operations plan is no different except it is taken a step further and put it on paper. Operations management plans can be very simple. A single sheet of paper with a map and tables may be all that is needed for a small operation. A large operation that requires several roads to be constructed and harvesting of several stands may require a little more. Upon completing this manual you may have the knowledge, experience and comfort to do your own operations management plan or you may choose to hire a forest technician or forester to prepare your plan. But, however simple or complex an operations management plan is, it is basically a document showing what you intend on doing with your woodlot property. As you work through the exercises in this manual and create your operations management plan for the fictional woodlot, you will find yourself going through a process of planning, decision making and problem solving. An operations management plan is the key principle and is very important. As you will see, this is because when you create a plan you have to consider most of the other principles. The majority of other principles will be included as part of the operations plan. For example principle number 4 states that roads will be constructed according the Department of the Environment Standards. Part of the process of ensuring proper road construction is by planning ahead of time where the road will go. This helps avoid problems. That is why a road plan is part of an operations management plan. Similarly, the Forest/Wildlife Guidelines include a requirement for buffer zones allow streams. The buffer zones can be marked on a map and included in the operations management plan. Some principles may not be explicitly indicated on the operation plan, for example principle number 6 on public awareness. However, these principles are just as important. You will soon find that following one principle helps you to follow others. Part of promoting public awareness maybe the simple act of maintaining a garbage free work site. Properly disposing of waste oil, oily containers and other hazardous garbage helps prevent violation of the Environment Act as outlined in principle number 4. As can be seen all principles are complementary. Before beginning the development of an operations management plan it is necessary to understand a number of terms and concepts used in the planning process. The following chapters provide this information. On the following page is an operations management plan for R.U. Ready's woodlot. Have a look at the plan and try to answer the following questions. 1. How many acres are proposed to be harvested? 2. 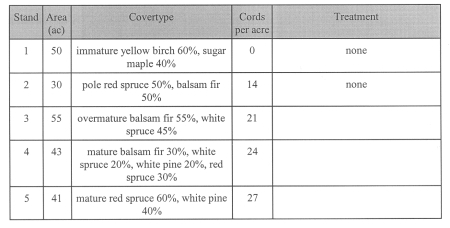 How many cords will be harvested? 3. How does the harvest in stand 3 facilitate renewal? 4. How does the harvest in stand 4 facilitate renewal? 5. Why is there a select cut only zone at the corner of stands 1, 3 and 4? 6. Do you think that the proposed harvest meets the landowner's objectives? The Forest/Wildlife Guidelines and Standards for Nova Scotia are designed to maintain or enhance fish and wildlife habitat in forests. By following these guidelines on all your forest operations you will reduce negative impacts your operations may have on wildlife. The guidelines were developed by the Nova Scotia Department of Natural Resources as a commitment to the Wildlife Policy of 1987. Three 4 hectare cuts, the irregular cut on the left provides the greatest amount of edge, the round cut on the right provides the least amount of edge. This manual provides a brief overview of the major guidelines. It will not cover all details of all guidelines. Edge- This is the zone where two types of stands meet. The edge may be between a cut and a mature forest or between a hardwood and softwood stand. Because the edge is where two different habitat types occur, it increases the number and variety of wildlife species present. The more edge available for wildlife the greater the richness of wildlife. Harvesting operations can be used to increase the edge in cuts. A round cut has the least amount of edge for area cut. An irregular cut shape maximizes the amount of edge. Wildlife Corridors- Corridors are strips of uncut forest within a clearcut that connect adjacent forest. Corridors provide travel ways for wildlife and allow them to pass through large clearcuts. Corridors provide concealment and protection from deep snow and wind. Special Management Zones- Special management zones are protective buffers of along streams, lakes and rivers. the area beside a water source is an important habitat for many species of wildlife. Stream side habitat often have a greater diversity and density of wildlife than upland habitat. It provides an important mix of water, food and cover and frequently has a greater richness of plants. Snag and Cavity Trees- A snag is a standing dead or dying tree. Cavity trees are trees with holes or cavities already excavated or could be excavated by woodpeckers. Cavity trees provide nesting sites for woodpeckers. After the woodpecker has abandoned the cavity, it may be used by many other species of wildlife. Snag trees are often invaded by insects and so provide foraging sites for many species of birds. Hawks and other birds of prey will perch on snags while hunting. Significant Habitat - Significant habitat includes areas of importance to wildlife. These might be deer wintering areas, hawk nests, heron colonies or habitat for rare or endangered species. Significant habitats are often susceptible to disturbance and care should be taken if a forestry operation is taking place nearby. Deer wintering areas can be identified readily. They are typically in mature conifer stands on south or southwest slopes. Look for plenty of deer tracks and well used trails. There will be a lot of browsed hardwood stems as well. A bird of prey nest looks like large cluster of sticks and debris in a tree. The birds will usually become agitated when disturbed during nesting season (March to mid July) and this allows for easy identification. If you discover a significant habitat near your operation, contact the nearest Department of Natural Resources wildlife biologist. The biologist will show how you may be able to alter your operation in a way that will reduce impacts on the significant habitat. Woodlot Home Study Course: Module 3 Thinning for Value. Nova Scotia Department of Natural Resources. 1. Take a look at the map for I.M. Ready's woodlot. Mr. Ready is planning on harvesting stands 3, 4 and 5. Assume, for Exercise 2 only, that these stands will be clearcut and mark on the map all the forest/wildlife guidelines that will have to be followed. How trees are harvested affects the type, amount and the method by which young trees become established. For example, clearcutting a white pine stand could result in hardwoods becoming established. However, if seed trees are left, chances increase that young pine seedlings would become established. The young trees that establish on the forest floor are known as regeneration. There are variations on each of these types, for example patch clear cut. Each system and its variations are designed to facilitate renewal with specific stand types and conditions. For examples shelterwood harvesting works well in mature white pine stands, but does not work well in young white birch stands. High grade cutting is the only system which is not recommended. High grading involves harvesting the best trees and leaving the poor quality, diseased, dying and suppressed trees. This usually results in the poor quality trees reproducing the next generation and as a consequence a poor quality forest for the next harvest. This manual will give a brief overview of the different harvesting systems and in what situations they are best applied. For more information see the reference list at the end of this chapter. The harvest of all trees from an area of forest land in a single cut is a clearcut. The assumption is that a new even-aged stand will be established. This can be through artificial (planting) or natural means. Research has shown that two-thirds of clearcuts in Nova Scotia regenerate naturally. In some cases clearcutting, followed by planting, is the only reasonable option. For example, old field white spruce seldom regenerates itself. In general, stands best suited for clearcutting are even-aged mature or older stands that have species that regenerate after a disturbance, e.g. red pine, balsam fir, aspen, and white birch. Other stands to consider for clearcutting are stands with a high percentage of dead or unhealthy trees. If there has been extensive fire, wind, or insect damage you may want to consider clearcutting. Other stands to clearcut are stands that are susceptible to blowdown such as when they are on ridgetops or in poorly drained areas. Also stands with tree species that are short-lived or unable to grow in the shade could be clearcut. Variations on clearcutting can be done to increase the chance of desirable regeneration establishing. Some examples are patch, strip and seed tree clearcuts. Shelterwood cutting involves a gradual removal of the over story to develop desirable natural regeneration. This system allows some sunlight to reach the forest floor which promotes the germination and growth of seedlings. The over-story provides seed and shelter for the seedlings. Shelterwood harvesting should be done in healthy even-aged mature stands that are windfirm. At least 30% of the trees in a stand should be shade tolerant species e.g. red spruce, eastern hemlock, white pine, yellow birch, sugar maple, white ash, red oak. Selection cutting involves a continuous harvest of trees without removing the over-story. A proper selection cut will involve the removal of poor quality, mature and over mature trees. As well, thinning is often done on immature trees. The openings created from the harvested trees provide space and sunlight for new trees to establish. In this way the stand continually renews itself. The process results in an overall improved condition of the stand. Selection cutting is not appropriate for all stands. Short-lived trees that don't grow well in shade are not suited for this type of harvest (white birch, aspen, balsam fir, eastern larch). Trees that are long-lived and can grow in shade are best suited for selection cutting (red spruce, eastern hemlock, white pine, red oak, sugar maple, yellow birch, white ash). If there are several age classes in the stand ( e.g. seedlings, poles, mature) the stand is ideal for selection cutting. If selection cutting is done on an even-aged stand it will eventually become uneven-aged. Woodlot Home Study Course: Module 2 Harvesting Systems. Nova Scotia Department of Natural Resources. Woodlot Home Study Course: Module 5 Stand Establishment. Nova Scotia Department of Natural Resources. 1. Using the table below write in the treatment section a proposed harvesting system for stands 3, 4 and 5 on the I.M. Ready woodlot. Decide what harvesting system will best facilitate renewal based on what tree species are present. Assume that there is no visible regeneration right now. Mature stands are stands that have reached their maximum volume, while overmature stands are losing volume and likely contain dead or dying trees. Of all forest management activities, forest access roads are cited most often as a source of soil erosion. Poorly constructed roads can increase silt in water courses, obstruct fish passage, deplete dissolved oxygen and lead to destruction of spawning and rearing habitat for fish. These problems can be reduced by using proper techniques for construction and maintenance of forest access roads and stream crossings. The Environment Act of Nova Scotia is designed to ensure that all access roads and stream crossings are properly constructed. Proper road and stream crossing construction is complex. There are many factors to consider such as soil type, drainage and topography. The Environment Act is also complex in order to cover all situations. If you are unsure about how or where to construct a road or stream crossing, get help. You can contact the Nova scotia Department of Natural Resources or the Nova Scotia Department of the Environment. A road or water crossing will cost less in the long run if it done right the first time. Fines and expenses for clean up can be costly. Environmental Standards for the Construction of Forest Roads and Fire Ponds in Nova Scotia. 1983. Nova Scotia Department of the Environment and Fisheries and Oceans Canada. Woodlot Roads Stream Crossings. 1992. By Glen C. Braithwaite. Nova Scotia Department of Natural Resources. 1. Take a look at the contour map of the I.M. Ready woodlot. Mark on this map or the management plan map, the best location for woods roads to access this woodlot. Keep in mind the tips from Chapter 4 for planning a road. There are many reasons to consider health and safety in a forest operation: human suffering, lost time and money and legal responsibilities. The most compelling reason, of course, is avoiding needless loss of human life and injury. In Nova Scotia, legal responsibilities are covered under the Occupational Health and Safety Act. Within the act, employers, employees and self employed are expected to take "reasonable precaution to protect health and safety of yourself and other employees". In other words, anybody working in the woods has legal responsibilities under the act. This also includes the health and safety of the public. If someone should wander onto the site where you are harvesting, you are responsible for their safety whether they were invited or not. Personal safety equipment is also covered under the act. Not just chainsaw operators require personnel safety gear, but foreman and machine operators require certain amount. You should also be aware of the Forests Act of Nova Scotia. This act covers wild fire. Under this act woods crews are required to have a minimum amount of fire fighting equipment during fire season. You have a crew of 13 people clearing out a boundary line in August. What fire fighting equipment do you require? What fire fighting equipment would you require if you where cutting the line in December? Name three pieces of personnel safety equipment by a chainsaw operator. A contractor with a crew of 12 people requires which of the following? A safety policy, a safety representative, a safety committee. You own a small farm and cut some wood on your woodlot to earn extra income. One day you forget your safety pants and cut your leg. Can you be charged under the Occupational Health and Safety Act? You are a contractor cutting on a private woodlot. The landowner comes up to see the operation, however the owner has no personnel safety equipment. Can you be charged under the Occupational Health and Safety Act? What might be a useful way to prevent people from wandering onto your job site without safety equipment? The public has become more aware and concerned about the environment. People expect forests to provide clean water, habitat for wildlife and places to picnic, hike and camp. There are multiple users of our forests and when a use or resource is threatened people become concerned. The public may go as far as to lobby elected officials or go to the media if the you feel strongly about an issue. This can lead to new legislation which can change the way we use a resource. Sometimes these new laws or regulations can be for the good. However, concerns are sometimes raised out of lack of knowledge. That's why it is important for the forest industry to help promote public awareness and knowledge. Although you as an individual may not have the opportunity to influence a lot of people, we as a group can have a big impact. If all individuals in the industry work together and do our little part a large change can be made. Participating in public awareness does not necessarily mean hiring a media consultant or having a large advertising budget. It can be many little things that individuals do day to day. For example one of the biggest complaints contractors hear from the public is garbage or litter left on the site. It is a small effort to make sure all litter is picked up after an operation, but it goes a long way in public relations. Other common problems are damage to roads and trails caused by heavy machinery, blocking access to walking trails and roads and excessive noise of heavy machinery late at night or early in the morning. Solutions to most of these problems are usually very simple. If you are near houses try to reduce the time heavy machinery operates in the early morning or late evening. If you know people walk a certain trail, keep it clear. The solutions are simple but you have to be aware of your surroundings. An effort has to be made to observe where your working and think about other users of the forest. It boils down to attitude. Some contractors and landowners go the extra step by making sure the site is pleasing to look at. For example, leaving an uncut tree buffer along a busy road or leaving some trees standing in a clearcut to break it up. Signs at the operation site indicating who is doing the work are helpful not only for safety reasons but also to demonstrate a willingness to show your work. At times you will get inquiries from neighbors and interested people. Your attitude and your employees attitude with these people may influence how they perceive forestry. If they are treated brusquely they may feel you are trying to hide something. This feeling is often transferred to the whole forestry industry. If you are part of a company you may want to consider having a process to deal with public inquiries. It can be something as simple as having someone designated to respond to inquiries. However, you should make sure that all employees are aware of the process. Also, employees should be able to respond to some questions about the operation and environmental protection. Employees are on the front line and often the first contact with the public. It is also sometimes helpful to have written information available to hand out to people. It can be something as simple as a copy of the Forest Stewardship Principles. At some time you may find yourself being interviewed by the media. It can be very stressful, but can also be a great opportunity to get across your message. don't say "no comment", it's better to say "legal considerations", "competitive" or "ethical reasons"
remember everything is "on record"
don't be afraid to say "I don't know"
You can measure your attitude toward public awareness by taking this test. 1. If you were a landowner, would you allow other users to access your land? e.g. hikers, snowmobilers, anglers. 2. When working on a property (your own or someone else's) do you post signs or have signs on your truck? 3. If a member of the general public asked you or an employee why you are leaving a dead tree on the harvest site can you answer the question correctly? 4. If an irritate member of the public asked is on a job site and is being difficult, do you try to deal with them in a calm professional manner or try to ignore them? 5. In the last 12 months, have you done anything to promote public awareness of forestry? e.g. given a talk to Scouts or Guides, written a letter to the editor of your local paper, provided seedlings to an interest group. 6. Is your job site free of garbage and litter when you leave? 7. If someone asks you about information on forest management programs in Nova Scotia, would you have a contact name and number available for them? 8. You arrive at a job site you have just finished, to pick up some equipment. You find somebody has dumped garbage on site. Even though you do not own the property would you clean up the garbage or consider it the landowners problem? 9. In the last 24 months have you attended a seminar, meeting, or workshop that has increased you knowledge of some aspect of forestry (silviculture, forest management, roads, environmental protection, wildlife etc.)? 10. Are you a member of any public interest group that concerns forests e.g. hunting and fishing association, snowmobile club, Scout or Guide leader, environmental group etc.? About 70 % of Nova Scotia is privately owned. Half of that is small private. As a result there is a tremendous forest resource on private lands in Nova Scotia. Numerous contractors and mills harvest wood or do silviculture on private lands. Many of us rely on private lands to supply us with work and revenue. It is important to remember who owns the land and to respect the landowner wishes when working on private land. If a contractor is disrespectful of the needs of landowners the local community and neighbors soon hear about it. As word spreads, the contractor may soon find there is nowhere to work. That is why it is important to recognize the right of private landowners to manage according to their own objectives. It becomes necessary to determine what those objectives are implement them into the operation. Actually determining landowner objectives may, at times, be difficult. Landowners may be vague about what they want or they may not be sure what kinds of benefits they can get form the land. Landowners may be reluctant to talk or don't want to show their lack of knowledge. Therefore it is important to make an effort to determine landowner objectives. When meeting a landowner for the first time make sure the owners objectives are promptly identified. Being observed can help you identify the owners objectives. If you arrive at woodlot and find an old farm house the objectives might be different than if you find a cottage. Bird houses and feeders may indicate an interest in wildlife. A pile of firewood in the back indicates that the landowner may understand that products come from the forest and trees have to be cut to get them. what is the land currently used for? how many people use the land? how long have you had the property? have you received any professional advice, management plan, etc.? do you know any landowners that have had a similar operation to what I am proposing? have you ever seen the proposed treatment? Once you have determined the landowners objectives write them down. Use plain english and be specific. Try to tie the objectives to a result. For example if a landowner wants to improve the condition of the woodlot you can say "to improve the quality of timber through silvicultural thinning to release crop trees". Some contractors write the landowner objectives on the operations plan and get the landowner to sign it. This reduces confusion or unexpected problems later on. At times you may find conflicts with landowners. This is not unexpected when dealing with people. In one instance a landowner wanted the contractor to cut the buffer he left along the stream. In another instance a landowner didn't realize the contractor was going to cut such a large area. All conflicts can not be avoided, but planning ahead and letting the landowner know your plans ahead of time will go along way to preventing conflicts. 1. Mr. Ready has indicated to you that he is retiring soon. He would like to get some money from the woodlot to build a camp along Trout Brook where he can spend his time fishing. Mr. Ready does not like to see large clearcuts and is concerned about capital gains if he gets too much money from the lot. Given these objectives what could you do with the current operations management plan to better meet these objectives? There are just a few of the most compelling reasons to have an operations plan. special considerations e.g. ground disturbance, other users. There are many sources of information to help in putting together an operations management plan. Check with landowners to see if they have had a forest management plan prepared. A forest management plan will have a map, cruise data and/or stand descriptions which are invaluable in preparing an operations plan. Aerial photographs are very helpful in preparing operations plans and can be obtained from your local Land Information Centre. Orthophotographs can also be obtained. Orthophotographs are large map sheets with black and white aerial photography as the base. Overlaid on the top of the photographs can be topographic lines which help in planning roads or property boundaries. By the time you complete exercise 8, you will have prepared an operations management plan for a fictional woodlot and should you have a good idea of how a plan is made. You may now be able to prepare your own plans. However, if you don't feel you can make your own plan do not be discouraged. There is a lot of consideration that goes into a plan and some prior skills and knowledge is necessary. You may want to hire a forest technician or forester to make a plan for you. However, you now have the knowledge to understand what a good operations management plan looks like. You have now completed a number of exercises on the I.M. Ready Woodlot. Now it is time to put it all together into an operations management plan. The map and table from Exercise 2 will become the operations management plan for the I.M. Ready woodlot. 1. In the table from Exercise 2, under treatment, cross out "clearcut" for stands 3, 4 and 5. Write in the treatment you proposed from Exercise 3. Include any changes you may have made in Exercise 7. 2. Using the contour map from Exercise 4, where you marked in your proposed road, trace the road onto the operations map form Exercise 2. This can most easily be done using a light table, but you can use a window or try it freehand. 3. From the description of Mr.Ready's interests in Exercise 7, write the objectives in a concise but complete manner on the operations management plan from Exercise 2. Try to tie the objectives to your proposed treatments. Title the objective landowner Objectives. 4. Is there anything missing from the operations management plan? You should now have a better understanding of the principles of Forest Stewardship. You now have a better grasp of what they mean and how to implement them into your own operations. By learning about these principles you gain an idea of some of the measures of sustainable forestry. As a member of the Nova Scotia Forest Products Association you are helping the Association make a commitment to the principles. This demonstrates leadership in the industry. As you implement these principles into your operation, you will find each situation different. People are unique, forest conditions change from place to place. You can refer back to this manual any time to refresh your memory. The reference lists at the end of each chapter can provide further information should you need it. Chapter 1 talked about how the key to a well run organization is having a plan. An operations plan is a document outlining what is going to be done on the woodlot. As you studied each chapter you added a component to the I.M. Ready woodlot operations management plan. Other guidelines that may need to be considered for an operations are significant habitats like deer wintering areas, raptor nests and heron colonies. In exercise 3 you designed a harvesting system that would best facilitate forest renewal. Chapter 4 explained how forest road and stream crossings can be very destructive to the environment if not done properly. In exercise 4 you developed a road plan to access the I.M. Ready woodlot. this kind of plan helps you anticipate problems and reduce cost. There are also many factors to consider when doing road and stream crossing construction. In Chapter 5, aspects of the Occupational Health and Safety Act were discussed. Responsibilities of employers, employees and self employed were mentioned. Also included in regulations to the act is the requirement for safety equipment on machinery and personnel. The Forest Act includes requirements for fire fighting equipment during fire season. Chapter 6 discussed how you can help contribute to public awareness and education. Small things like a clean work site or a friendly attitude towards inquiries goes a long way too helping with the public image of the forest industry. You should now be able to increase your public awareness IQ. In Chapter 7, the importance of landowner objectives were discussed. An effort has to be made to make sure owner objectives are included in an operation plan. In exercise 7 we discovered how landowner objectives can change how a proposed operation is done. As the Home Study modules become available copies will be made available for download. At this time only the Introduction - Getting More from your Woodlot, Module 2 and 9 are available in French. Natural seedling from seed trees. 6. Yes, although stand 2 is also mature and harvesting may further help meet objectives. Stand 3: Clearcut, reassess for natural regeneration in 2 years. Likely will require planting. Stand 4: Several options are possible for this stand: seed tree cut leaving white pine seed trees; clearcut with natural regeneration; shelterwood harvest. Any three of the following: helmet set, protective trousers, first aid kit, pressure bandage, protective boots, gloves (not mandatory). Self employed people are covered under the act and can be charged when in violation. You are responsible for the safety of all people on the job site. Signs posted at the job site are a good way to prevent visitors without safety equipment. If you answered yes to all the questions, congratulations you are a credit to the industry, we need more like you. If you answered yes to 7 or more questions, very good, you are very aware of public concerns. If you answered yea to 5 or 6 questions, not bad but need improvement. If you answered yes to less than 5 questions, you need to become more aware and think about public concerns. There are many ways to change the operations plan to help meet Mr. Ready's objectives. One possible option: Using the road plan that crosses Trout Brook will provide access to the brook for building the camp. Shelterwood harvest stands 4 and 5 avoids clearcutting and provides income over a period of years and reduces capital gains for 1 year. There is little option but to clearcut stand 3, however depending on the condition of the stand it may be possible to patch or strip clearcut, thereby reducing the size of any one cut. Question 4. Considerations not included that may need to be, depending on circumstances are: significant habitat (deer wintering area, raptor nests, heron colony), other users of the woodlot, ground disturbance (soft or wet ground, rocky or sensitive soils).